This comprehensive book focuses squarely on academic portfolios, which may prove to be the most innovative and promising faculty evaluation and development technique in years. The authors identify key issues, red flag warnings, and benchmarks for success, describing the what, why, and how of developing academic portfolios. 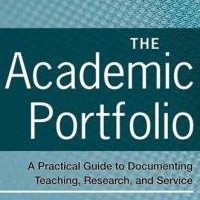 The book includes an extensively tested step-by-step approach to creating portfolios and lists 21 possible portfolio items covering teaching, research/scholarship, and service from which faculty can choose the ones most relevant to them. Peter Seldin, J. Elizabeth Miller. Note: The kindle version missing sample portfolio table of contents.